This little crocheted raccoon amigurumi is just so adorable with curious ears and a striped tail. It is soft and plushy. It is always getting into mischief. 🙂 They are the perfect addition to your baby shower. It can be placed in your baby’s nursery as decor until your little one is old enough to want to play with it. 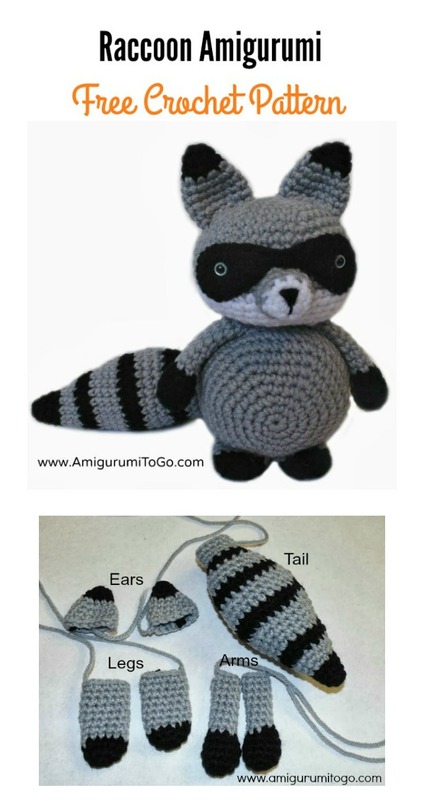 The Raccoon Amigurumi Free Crochet Pattern can be made from any weight yarn and appropriate hook for different sizes. It will be a perfect gift for your friends and children. It’s absolutely safe, as it does not contain small parts. Thanks Amigurumi.today and Amigurumi To Go for sharing the wonderful free crochet patterns. The links for the free patterns are provided below photos. Happy crocheting.